Subtle cool colors, iridescent glazes and geometrical details are in perfect harmony with the surrounding architecture of the Millender Center and Omni Hotel. 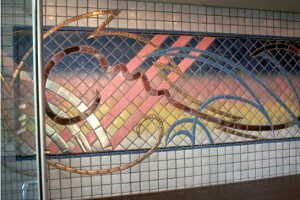 Mr. Loving,a nationally known painter and Guggenheim Fellow, worked at Pewabic Pottery and used their expertise and facilities to help create this fresh statement in tile. Loving is a painter who learned to do tile for this project. The two murals show rain, lightening, rainbows, silver lined clouds, and sunrise. He wanted this piece to be almost like a window from which you can look out at the world. The mural is so big that when it was laid out on the floor, he had to be rolled across it laying on a scaffold to put the finishing touches on. Funded By: Forest City Enterprises / Millender Center Associates, City of Detroit, Detroit People Mover Art Commission. Copyright © 2018 Detroit Transportation Corporation.